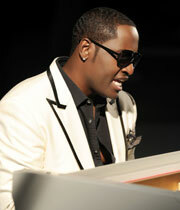 The GRAMMY Museum is honored to welcome R&B sensation Johnny Gill to the Clive Davis Theater. Gill was a strong force with New Edition and a became successful solo artist best known for his romantic ballads with back to back #1 R&B classics My, My, My and Rub You the Right Way. Gill connected with singer/songwriters Gerald Levert and Keith Sweat to form the musical super group LSG. The trio created a multi-platinum debut album Levert.Sweat.Gill (LSG) with the lead hit single My Body. In addition to numerous tours and appearances with LSG, New Edition and as a solo artist, Gill will release his first new solo album in sixteen years, Still Winning (J Skillz Records/Notifi Records) on October 11, 2011. His first single In the Mood is currently #8 on Billboard's Urban Adult Chart. Still Winning features GRAMMY Award winning producers Jimmy Jan and Terry Lewis, Bryan Michael Cox, Wyclef Jean and Troy Taylor. During the program, Gill will share memories of New Edition and LSG and discuss his brand new album. After the interview, moderated by Vice President of the GRAMMY Foundation and MusiCares Scott Goldman, Gill will take questions from the audience and will perform.